Lonicera is a genus of about 108 species of which many are climbers unsuitable for bonsai use. However, there are a number of shrubby honeysuckles / Lonicera that make excellent subjects for bonsai. Shrubby Lonicera species include L. pileata and L. nitida which are both evergreen shrubs often used for hedging. It is their ability to regenerate from old wood and the minute size of their leaves that make these two honeysuckles such good species for use as bonsai. With sufficient growth in the ground both species develop heavy, thick trunks and have light, fawn coloured bark that peels off in strips revealing a smooth, light-coloured underbark. Both species produce insignificant flowers and purple berries. Lonicera nitida is a bushy, evergreen shrub with paired ovate leaves to 1cm long, they are glossy, dark-green above, lighter beneath. Originally native to China where they reach around 3-4 metres with a 3metre spread. L.nitida has a number of varieties which carry differing coloured leaves including the widely available 'Baggesen's Gold' which has yellow and purple hues to its green leaves. Lonicera pileata is of a similar appearance though it carries slightly larger leaves which grow to 3cm. Originally native to China, L. pileata is less vigorous and has a more spreading habit, reaching heights of only around 50cm. POSITION Full sun. Frosts below -5°C can cause lose of foliage though this is quickly replaced in Spring. Some frost protection is advised for trees in very small pots. REPOTTING In Spring as new leaf-buds appear. Use basic soil mix. PRUNING Constant clipping is essential to keep foliage pads tidy and to encourage dense growth. Foliage should be thinned out in Spring to allow light to reach inner leaves. Carving or hard pruning can be carried out during late-Autumn and Winter. PROPAGATION All types of cutting strike readily during July and August. Ground-layer shoots August to November. Sow seed outside in February or March. By division in Spring. 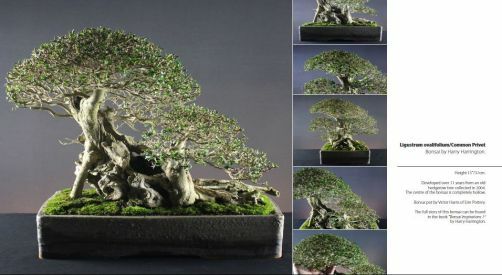 STYLING Old Lonicera trunks tend to be stiff and erect and this can create difficulties when designing them as bonsai. Trees can either have curves built into their design by using primary and secondary branches or can be carved to create dead-wood effects. Suitable for all forms except broom in all sizes.